The Zee Telugu Apsara Awards 2018 recently took place at Kotla Vijay Bhaskar Reddy Indoor Stadium in Yousufguda, Hyderabad. Known to celebrate womanhood and acknowledge their contribution to society, the third edition of the Apsara Awards saw a number of South Indian celebrities gracing the event. 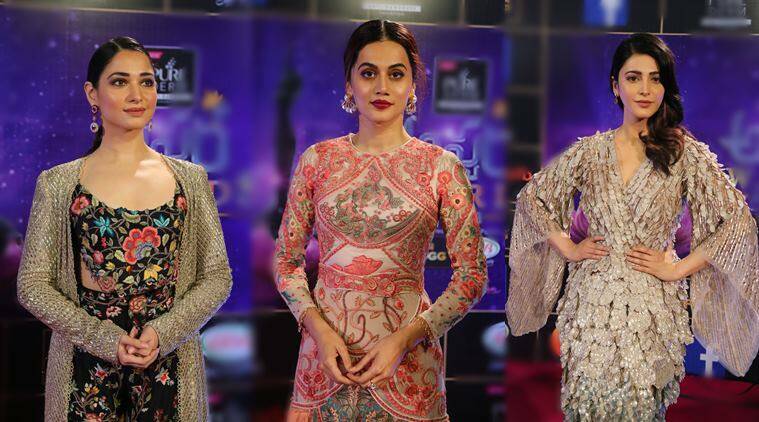 While Kajal Aggarwal, Tamannaah Bhatia, Mehreen Pirzada and Sree Mukhi took home the trophies, other celebrities like Shruti Haasan and Taapsee Pannu also made an appearance to show their support. Awe actor Kajal Aggarwal took home two trophies – Best Actor for the year 2017 and Best Actress for the Decade. While she looked gorgeous in her structured black saree, she even took to Twitter to thank her fans. “Thank you for the best actress of the year and best actress of the decade, Zee Apsara Awards. Was amazing to witness so many wonderful women excelling in their respective fields. Extremely inspiring huge congratulations to all of you! #ApsaraAwards2018,” tweeted Kajal.